My family is originally from the coastal Chinese province of Fujian. Traditionally our noodles are cooked in soup, boiled unadorned except for seasonings, or stir-fried in a wok with a thin sauce. When I was about ten years old my family went to a Cantonese dim sum house in Singapore, which at that time was an exotic excursion for a family accustomed to mostly eating Fujianese food. We were served a pan-fried noodles dish of delicious seafood vegetable sauce dripping all over thin golden brown crispy noodles. That was the beginning of my life long love affair with Hong Kong pan-fried noodles. Similar to the old-fashioned American Chinese food known as chow mein, Hong Kong pan-fried noodles share the same name in transliteration. 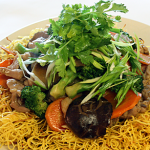 In Cantonese it is in fact called “chow mein,” which means fried noodles. But they are not exactly the same. In both cases the noodles are characteristically crunchy. While the noodles in the American version are thick and dry and have the consistency of a cheese stick, noodles prepared in the Hong Kong style are thin like vermicelli that are fried like pancake with crispy surface and soft center. The sauces in both cases are made with meat accompanied by a mixture of vegetables covered in a fair amount of thickened gravy. In the American version though the vegetables are mostly ingredients easily available at local markets such as celery, bean sprouts, carrots and onion. They are regularly overcooked to the point that the individual vegetable looses its own distinctive well-rounded flavor that complements the noodles. There are enough differences between American chow mein and Hong Kong pan-fried noodles that food historians wonder if these are versions of the same dish, or whether they developed separately. In his book, Chop Suey: A Cultural History of Chinese Food in the United States , food historian Andrew Coe argues for separate development when he states that “Although the chow mein that was cooked in the Pearl River Delta (in China) was a distinct dish, as served in the uptown joints (away from downtown Chinatown) chow mien was simply chop suey over fried noodles instead of rice.” I speculate that the early Chinese settlers were very likely trying to recreate Hong Kong style pan-fried noodles but with limited access to Chinese ingredients ended up creating the American chow mein. Old-fashioned American chow mein is now very rare and hard to find. It is easy to see why people are abandoning the American version and falling in love with the authentic kind. It is flavorful and easy to make. My neighbor, Kim, has become a devoted fan of the Hong Kong style pan-fried noodles. She fell in love with this dish after I served it one Sunday dinner as a last minute meal. She now regularly stocks up noodles that she buys from Chinatown in her freezer. Then when her daughters Lucy and Edie are in the mood for noodles she’d prep all the ingredients in the afternoon and pan-fry the noodles at the last minute while stir-frying the toppings at the same time. So try my recipe and you might also fall in love with it. Combine the chicken marinade ingredients and mix well. Marinade the chicken slices for about 20 minutes. Over medium setting heat 2 tablespoons of vegetable oil in a large frying pan until hot, about one minute. Spread the noodles evenly in the frying pan. 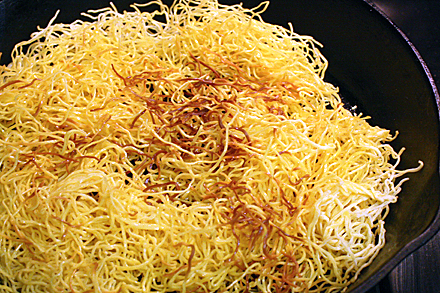 Pan-fry the noodles on both sides until golden brown, or about 8 to 10 minutes on each side. Heat a wok over high setting until hot, about two minutes. Swirl 2 tablespoons vegetable oil into the wok and heat for another minute. Put the marinated chicken slices in the wok and stir-fry until the exterior of the chicken has completely changed color, about 2 minutes. Remove the chicken from the wok and set aside. Wipe the wok clean and heat it over a high setting until hot. Swirl 2 tablespoons vegetable oil into the wok. Add the ginger and garlic slices and stir-fry until fragrant, about 30 seconds. Add the carrot slices and stir-fry for about one minute. 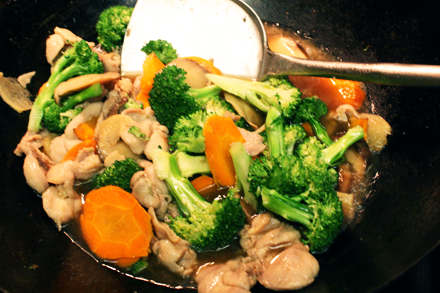 Add the shiitake mushrooms and broccoli to the wok and stir fry for another minute. Add about a half cup of water while stir-frying the vegetables if necessary to prevent them from scorching. Cover the wok and continue to cook for one more minute. Return the chicken slices to the wok and add all the sauce ingredients except for the cornstarch slurry. Cook until the sauce starts to bubble then add the cornstarch slurry. Continue to cook until the sauce thickens. Place the crisp-fried noodles on a large round platter then pour the chicken sauce over the noodles. Garnish with the scallion slices and cilantro sprigs. Serve immediately. 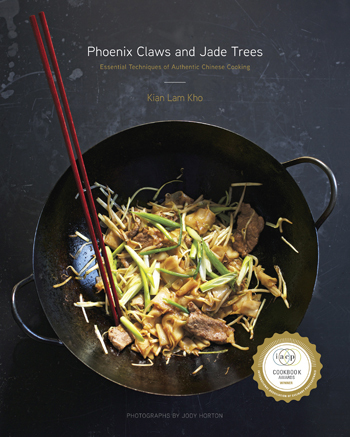 Kian, by HK-style noodle, do you mean the fresh egg-based noodle that’s also used for wonton soup? I’m based in Guangzhou, and there’s about 100 different type of noodles at the market. If you can provide the Chinese name that would be great! Also, do you boil it quickly beforehand, or just put it right raw into the wok? By Hong Kong style noodles I meant the vermicelli type very thin fresh noodles. Yes they are used in wonton noodles soup as well. There are usually uncooked and precooked varieties in the markets. I like to use the precooked type to make pan-fried noodles. The uncooked type I would use for noodles soup. Quickly dip in boiling water for about a minute and you’re done. Strain the noodles then add soup and wonton. In Asian you can sometime find the shrimp flavored variety. They are great for soup as well. In a pinch you can use dried noodles as well. follow instructions on the packet if any then drain and let them dry thoroughly before pan-frying. Kian: I read your blog actively for chinese recipes. Thank you so much for posting this! My chinese husband (who grew up in HKG) used to tell me I cook like a gwai lo…but I am getting so much better thanks to you. Love the blog; love the recipes. I’ve heard of “2 sides brown” before, and it all sounds yummy. One question, though: how do you serve it? Don’t you need a knife to cut the noodles? Or will they just pull apart? “2 sides brown” is the Shanghainese version of crisp fired noodles. Usually made with thicker noodles. I much prefer the Cantonese version. No, you do not need knife to cut the noodles. The gravy from the toppings actually soften the noddles and you can actually pull them apart with chopsticks. Thumbs up! Another great Asian recipe, thank you! I’m a big fan of Hong Kong-style pan-fried noodles, but even in Hong Kong you have to be very selective about where to eat, because most cooks in the territory make a poor job of preparing them. I would contest your use of the term ‘vermicelli’, which in Hong Kong is usually applied to mai fan, or rice noodles, which cannot be pan-fried. The noodles in chow mein are made with wheat flour. By the way, if you’re ever in Hong Kong, without doubt the best place to eat pan-fried noodles is described in this link, which includes some photos. I’m afraid you’re not going to be able to find fresh Hong Kong style noodles through mail order. The closest I can find for dried noodles is on Amazon. It will not taste exactly the same but can be a good option. When you cook the dried noodles be sure only dip it in boiling water for about on minute or until they are just limp. Immediately drain the noodles and rinse under cold water to cool off. Then deep fry the noodles instead of pan-frying. I think you will find the result better this way. I am looking to replicate an egg noodle dish that I usually buy from a nearby Asian place. It has those very long, bright yellow and curly egg noodles, and along with various Asian vegetables, is served with chicken, pork and shrimp. If I remember correctly, the dish is called something like Cantonese Noodle. Would your recipe be similar to this? 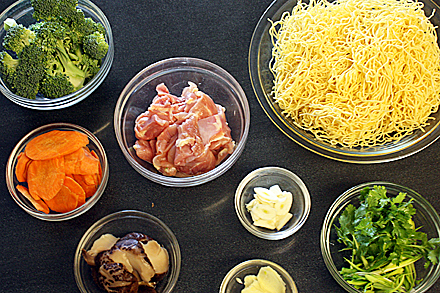 Cantonese noodles can be prepared is many different ways. The recipe in this post produce a crispy pan-fried version that is very popular in Hong Kong and beloved by many. The same noodles can be cooked in broth to make noodles soup with all kinds of meat. Without knowing more about how the noodles are served at the restaurant I would not be able to determine if it is the same as this recipe. But try making this pan-fried noodles anyway. I’m sure you will enjoy it. A few questions for you since I’ve made this dish now. First of all, since I’m uncomfortable with ounce measurements, especially for pasta, approximately how many cups would the required quantity of noodles fill? Also, regarding the shiitake, you say to cut them in half, but the shiitake I found are pretty big, so wouldn’t it be better to cut them in thirds? This is what I ended up doing, btw. And regarding their stems, I was surprised to find how hard and chewy they are. I didn’t mind this too much but I’m just wondering if you leave the stems on when you make this dish? I’m glad you’ve made this recipe. I hope you enjoyed it. A far as the amount of noodles you can estimate about 3 cups of firmly packed cooked noodles to the recipe. The idea is to have just enough noodles to absorb the wonderful gravy along with just right amount of topping ingredients. The stem from rehydrated shiitake mushrooms are usually cut off and discarded. As well these mushrooms come in many different sizes. With small ones you may not even have to cut in half but larger ones just cut them into bite size pieces. It’s very good, I’ve made it several times since then. I found that I really like the chewy texture of the shiitake mushrooms too, but it took some experimenting with a few different ways of rehydrating the mushrooms to find a way to make them just tender enough. For instance instead of warm water and just letting them sit in it for about 15 minutes, I use boiling water that I let them sit in for about 45 minutes. Also, do you personally ever eat the foot? Others haven’t really liked this mushroom but I find its taste original and more interesting than the typical button mushroom we’re used to eating. I’ve also read that you can make a broth with the foot if you want, to use in other recipes. Also, in my case, I bought a large bag of mostly medium-to-large-sized dry shiitake from a local Asian grocery store that I had just discovered. About the noodles, you must 3 cups of the wet noodles, right? In other words, my package said to pour hot water on them and drain them, and then to stir-fry them. And I didn’t have a wok until recently, so all things considered, the recipe turned out really even with a regular pan. The only problem I encountered was that since I did not make this recipe several times within a short period and had bought quite a large bag of fresh noodles (as opposed to dry), we ended up finishing the bag with a few noodles having grown a little blue on the ends. After sorting them though, we fried the rest and they tasted good. I guess I did not read your suggestion of freezing them. Btw, ounce quantities confuse me a little, and the conversion was a bit iffy, so I am curious as to how many garlic cloves you used exactly? In my family we mash a bunch of garlics it into a puree that we keep frozen, so sometimes for expediency I just used, but when I sliced the garlic into thin slices, I used about 3 garlic cloves. Is that about right? What about the ginger? In my various attempts, I’ve used both ginger slices in the same shape as the garlic, ginger slices the same as in your picture, and powdered ginger. I found that the powdered version didn’t give as fragrant a taste, but when I used fresh I seemed to always end up using a little too much. Regarding the gravy, it can’t really be seen in your picture but mine ended up quite thick, to the point that it makes the portion of chicken and vegetables shrink quite a bit from when it’s cooking. Either way, it tasted absolutely great with the noodles. I was looking for a recipe of Cantonese noodle with chicken, pork and shrimp similar to the one I usually buy from a local restaurant, but this ended up being even better and quite different. They use bok choy and onion slices as well as water chestnut slices, but though I bought the latter in a canned form, I haven’t quite figured out a way to incorporate it yet. I like it because of its crunchiness. If you have any tips on that, please let me know. This recipe sounds so good, can I use shrimp ?, will I have to make changes with the sauces ?…Keep up the great work 🙂 ! Yes, you can use shrimp or any shellfish for this recipe. They all go well with the same sauce. Enjoy! Hi. The Hong Kong style noodles seems delicious. I guess I can get the noodles in Malaysia but I am looking forward to make it on my own soon! Thanks for sharing the great recipe ! 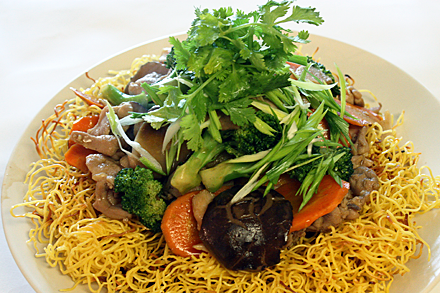 I love pan-fried noodles with anything on top! Have you ever had really crisp pan-fried noodles topped with sugar and vinegar? I had this in restaurants in Hong Kong when I was young but have never seen it since or anywhere else! I’ve never heard of noodles topped with sugar and vinegar. Sound unusual.